Bengaluru is awaiting the release of Mater Plan 2031 (RMP 2031), after the draft master plan was closed to comments in January 2018. Many articles in the print media have discussed the highlights of the plan’s proposals related to transportation, housing, zonal regulations and other aspects, and provided a critique of the development strategies of the plan from various perspectives. Civil society groups and the media have made efforts to help citizens grapple with the complex contents of the plan, with the intent of explaining how to read and understand the plan in a bite-sized manner, and comment on it constructively. This article focuses on one aspect that has not been discussed so far: the role of urban design in city planning and the opportunities that a city-level plan presents to assimilate design ideas into its development goals. We try to discuss the urban design propositions of the Draft RMP 2031 in light of the planning strategies and vision for the city and offer suggestions for how urban design prospects may be enhanced. Spatial planning as a process, responds to the dynamic growth of a city and its changing relationship with the region. It provides a framework for managing the physical and spatial characteristics at the regional, city and local levels. Urban design is the practice of giving form, shape and character to the physical and spatial components of a city to make it inclusive, livable, attractive and comfortable. It is a collaborative and multidisciplinary process involving the professions of city planning, landscape architecture and architecture, through which the physical setting is shaped to make places for various kinds of activities. As a discipline, urban design addresses human needs ranging from the basic need of security and comfort to the most abstract need of aesthetics to enhance self-worth (Lang, 2005). In the Indian context, the act of space production and city design is confronted with complex issues posed by multiple expressions of urbanisms, varied understandings of informality, and different modes of interaction of varied actors. The discipline of urban design needs to look for new perspectives to address these contemporary challenges. With this understanding of urban design, it may be relevant to ask: How might a city’s master plan make provisions to shape its form and character and determine its identity? Development plans hold the opportunity to provide a city level framework for urban design through which the city’s physical and spatial components may be shaped to create conducive environments for people to conduct socio-cultural, economic and political activities. This facilitates the interpretation of the city’s vision and spatial strategies at the regional, city and local area levels. It also aids in guiding public investments. Specific strategies within the urban design framework have broader objectives of embodying people’s aspiration for inclusive places of social interactions. These strategies address their social, cultural and economic needs, while mitigating the negative externalities of urbanization, such as depletion of natural resources, displacement of communities, decreased livelihood opportunities, social exclusion and segregation, and reduced quality of living, among others. It outlines strategies for urban design which focus on a generic list of things – certain areas that require special and intended treatment, lake fronts and buffer zones, streetscapes, parks and open spaces, places where street vending happens, plan for landscaping, accessibility plans for transport and educational institutions, conservation for heritage zones, street signage, and universal accessibility needs. Recommendations provided for some of these areas are generic enough to be implemented in any other city. This is a myopic vision of how urban design might be envisioned and implemented. There are no larger strategies that spatially connect the various public features of the city in a systemic way. While the Draft RMP 2031 attempts to articulate the spatial and formal expressions of these principles, it fails to consider how an urban design framework might be developed to manage the outcomes of the various development strategies implementing these guidelines. Based on the above guiding principles, the vision of the Draft RMP 2031 is to have a “liveable and well-governed Bengaluru premised on efficient mobility and vibrant ecology.” If both the vision and the related proposed urban development strategies are accepted, the plan falls short of articulating the spatial and formal implications on the aspects of livability and inclusiveness, an outcome of a well-governed city. To do this, specific indicators (quanitative and qualitative) that define “livability” and “inclusiveness” are to be identified and assessed. Such an evaluation would help to prioritize areas for improvement and enhancement, where urban design initiatives may be implemented in conjunction with development strategies and regulations. An overall urban design framework may include these aspects, to bring clarity to the vision and guiding principles. One spatial strategy of the Draft RMP 2031 is to limit the Floor Area Ratio in the city core and allow additional FAR in the peripheral areas. Such a strategy will have implications on the city’s form and character. At the local level, the identity of parts of the city that is characterised by distinct built fabric and special street and open space features may be threatened. At the city level, the strategy may promote sprawl that brings with it the burden of additional costs for provision of services. The question remains as to how, through design-based approaches, can these areas of traditional character and distinctness be better managed to ensure that they do not, on one hand, succumb to forces of global capital flows, and on the other, become stagnant and lifeless. Second, the areas under consideration for developing urban design guidelines may be mapped and the spatial strategies that link these areas across the city may be articulated thematically. This approach presents an opportunity to link to existing features and local people’s needs and aspirations. For example, the spatial strategy to provide buffers for the ecologically sensitive areas, such as the water bodies and the natural drainage system (nallahs) linking them, holds a promising potential for realising urban design initiatives. Design strategies, not limited to regulations restricting certain types of development in these areas, may be instituted to enhance place-based character and induce socially inclusive public spaces with the underlying theme of ecological design. Such strategies would speak well towards harnessing the potential of the natural resources of the tank and nallah system as urban commons. 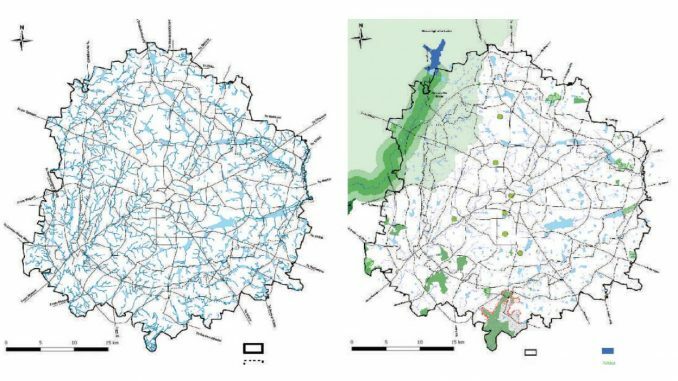 Moreover, Bengaluru, with its fading rubric of the “garden city”, begs for a city-level design strategy to form spatial networks that link its ecology with the green and open spaces of the city. Another instance is the manner in which local market places in the city are linked at various scales to become venues supporting economic, social and cultural activities and events. Here, spatial and non-spatial networks of interdependencies sustain these market spaces as places of social and economic importance. This needs to be recognized and promoted through design initiatives. Sensitivity to how informal activities such as street vending may be governed and sustained to make the market spaces inclusive and economically viable needs consideration. In the chapter on Heritage in the Draft RMP 2031, a conscientious effort has been made to document heritage structures of cultural significance. Precincts are identified and within them certain recommendations are provided to conserve the heritage. Specifically, certain view corridors (vistas) are identified; however there is no mapping of these views, an element that might have been included in the urban design plan. Third, besides the geographical mapping of the areas considered for urban design interventions, special zoning overlays that institute design guidelines for the designated areas may provide a framework for implementation. Designated review panels may be instituted for proposals to undergo a review process. This may be done at a local level and at a city level, depending on the scale of project and their developmental influence and may be part of the institutional framework outlined for plan implementation. The Draft RMP 2031 does not make any attempt to think of details on implementation modalities for the design strategies. The proposal to constitute a heritage committee is not adequate as the various physical infrastructure assets in the city that occupy and influence the public realm also need to be reviewed. If the dormant “Bangalore Urban Arts Commission” is revived it could be entrusted with new functions of reviewing public projects and buildings with a view to make them contextually responsive and socially responsible. Besides, infrastructure projects and interventions in the public realm such as public markets, publicly owned commercial complexes, cell towers, advertisement hoardings, pedestrian overpasses, and metro stations also need to be reviewed for their appropriateness and sensitivity to the character of the local area. Fourth, the involvement of citizens at the local or neighbourhood level is important to implement an urban design strategy. This has been very limited in the Draft RMP 2031 planning process. Continued involvement of people at all stages including the visioning, strategy building and detailing out the land use and zonal regulations, is critical to formulate design strategies. Without this, there is a high probability of seeing gaps between the people’s aspirations and the plan outcomes, resulting in detrimental social and experiential impacts. Citizen involvement would help in identifying opportunities for spaces of public use, including places with shared social, cultural heritage values, places where formal and informal economic activity thrives and supports local economy, and places supporting socio-cultural practices and events at both local and city levels. It strengthens the design intent of each planning strategy and makes them inclusive. The lack of consistent citizen participation in making decisions for public interventions affects implementation and enforcement. While an urban design framework may be informed by the city’s history, its physical, social and cultural assets, it is not limited to only this. There are many areas in the city which are specifically targeted for higher density or planned for specific types of development, for example, the transit oriented development (TOD) designated areas. The expectation is that these areas will attract people and incubate places for public use. The streets and public spaces in these designated zones need to be designed well to make them socially inclusive, safe and comfortable to access the public transport. The previous Master Plan for Bengaluru, RMP 2015, had no mention of urban design. Hence having a chapter devoted to urban design is a welcome addition to the Draft RMP 2031. However, integration of design objectives into the planning framework needs careful thought. For this an urban design framework that addresses design issues at the scale of the city as well as the local areas (neighbourhoods) is to be articulated in conjunction with the planning framework. When the vision for the time horizon of 2031 is developed, and various strategies that guide future development in the city are decided, a supporting urban design strategy that provides direction for shaping the character of public areas must be given. Such a framework would reflect the sectoral challenges of a master plan, and the trade-offs and negotiations between the planning goals and people’s aspirations. It might also highlight key features of the city that cannot be compromised and make them central to the urban design concept. On such example is the system of tanks and streams in Bengaluru. The urban design framework must constitute design strategies that can translate into specific urban design projects. However, it must be coordinated with the planning vision and it needs to be flexible in format, allowing innovation in design without being prescriptive. It must also provide for a shared understanding of the design priorities for Bengaluru and how it might be implemented through a collaborative approach between the government, private entities, non-state actors and the citizens. The challenge lies in proposing a framework that reflects the local social, cultural, and economic needs and values; is sensitive to the ecological resources; flexible enough to allow for negotiations and collaborations that make it socially inclusive; and is anticipatory of future development trends. Such a framework will create value and enhance perceptions of place in the city.